[Posted Sunday morning] The past week was very special. Not just because we celebrated Christmas. But, it was especially special because of the fact that my wife Aafje and I had our fiftieth wedding anniversary. Passing the milestone of fifty years of marriage brings lots of congratulations. Mentioning it on your Facebook page will see to that! That is very enjoyable. But to be together for fifty years is most of all a reason for gratitude. Although golden wedding anniversaries are not rare, there are lots of couples that do not reach this half century mark. One must marry rather young to increase the changes of reaching this goal. And, nowadays, many people cohabit for many years before getting officially married. So, if you start counting from the moment you received your official license, you reduce your changes of a golden wedding anniversary. And, of course, there may be many reasons why a marriage does not last for half a century. Must you be perfect to be sure that your marriage will endure? That was, in any case, not our secret. My wife is possibly a bit more perfect that I am—but being perfect, or always having made perfect choices, it something we cannot pretend. Our life together has not been perfect, and neither has our life as a family, but we did have a happy and certainly very satisfying fifty years with a lot of variation—and we hope that we have many such years in good health ahead of us. Of course, I ask myself: why did we succeed in remaining together, while so many do not succeed? The main requirement is, of course, that there is love and loyalty. But I have also concluded that a couple must not only do and experience a lot of things together, but must also give each other enough individual space. There must be common interests and ideals, but each partner must also be able to pursue his/her own interests and be able to have his/her own opinions. As to this latter aspect, we have no reason to complain. This very special week is past. A few more days and 2014 is behind us. It has, in fact, also been a special year. Two things have marked this year in particular. First, our three months in California, where I served during a quarter as a visiting professor at Loma Linda University. And, secondly, the unfortunate fall of Aafje, which left her rather handicapped during a number of months and forced me to spend much more time than usual performing household duties. In addition, the work of editing the Festschrift for dr. Bertil Wiklander was a major undertaking. And many other projects made 2014 quite a full year. Now there are a few quiet days left to bring 2014 to a close. Yesterday (Friday) we drove North to Assen where we spent a few enjoyable hours at the exhibition of the Russian painter Malevich in the newly renovated Museum of Drenthe. Today (Saturday) I had to face the first snow of this year when driving to Rotterdam, where I preached. During the coming days I hope to spend some good hours with the final 250 pages of Bart van Loo’s fascinating new biography of Napoleon and with the amusing book of Herman Finkers, that I found under the Christmas tree. Its title already provides a foretaste of the kind of humor that characterizes this comedian from the Achterhoek (a region in the East of the country): The Seminar ‘How to Deal with Disappointment’ is cancelled once again! This entry was posted in Uncategorized on December 28, 2014 by Reinder. As it has done in the past few years, in the weeks before Christmas the United Protestant Church in the Netherlands (PKN) is sponsoring a television ad that will be aired some twenty times. It is an attractive Christmas commercial that may be viewed on the public channels. There are two reasons why I applaud this initiative. Firstly, it is good to welcome as many people as possible to church in the Christmas services (and hopefully also later on). But, secondly, it is also a very good thing to make the church visible. In the midst of a flood of Christmas advertising for food, Christmas dinners, presents and short holidays, the church must tell the world it is still there. There is another Dutch denomination that has decided to use the mass media in an effort to reach the larger public, namely the small Remonstrant Church. This faith community has about the same size as the Dutch Adventist church. The Remonstrant Church has also about 6.000 members in about 50 local congregations. In many places it closely cooperates with the Doopsgezinde Kerk (a Dutch branch of the Mennonites). In the Netherlands, both denominations belong to the liberal segment of Protestantism. The Remonstrant Church has genuine Dutch roots. In the early sixteenth century Dutch Protestantism was engaged in a fierce battle. The core of the conflict was the issue of predestination versus human free will. Remonstrantism rejected Calvin’s doctrine of predestination and defended its conviction that each human being is free to decide whether to accept God’s grace or to reject it. During the famous Synod of Dordrecht (1618-19) Contra-Remonstrantism won the day. Ever since the ‘Rules against Remonstrantism’ are part of the official confessional documents of reformed Protestantism. Today the Remonstrant believers are still part of the Dutch religious landscape. A few days ago I saw in Trouw—a Christian daily newspaper in the Netherlands—a full page advertisement with a slogan in large lettering: My God allows me to think for myself. These words allude to the fact that members of the Remonstrant Church do not have to subscribe to a particular doctrinal statement. They may themselves determine what their confession of faith looks like. For many people this is an attractive thought. And, as I read this slogan, I could not suppress the idea that it might be good if some people in the Adventist Church would meditate a bit on those few words. I would not easily be convinced to become a member of the Remonstrant Church. For me the content of the average set of beliefs of the members of this church is too meagre . But I must confess that these advertisements have a certain appeal for me. It shows an openness and a tolerance which I often do not detect in my own spiritual home. However, there is a fundamental problem with these various messages that are sponsored by the Remonstrant Church. At the bottom of these ads the reader finds a small paragraph . This begins with the words: Faith begins with you. That is where the sponsors of these ads make a crucial mistake: Fortunately, faith does not begin with us! Faith originates with God. It is his gift to us. Faith is not a movement from below towards the Above, but it comes from Above to us, humans, below. One can hardly think of a greater difference. However, when all is said and done, I am somewhat jealous of the denominations that have discovered the large mass media in an effort to become visible. I can only hope that my church will also catch the vision (and can somehow find the necessary funds) to embark on this same path. The world must be made aware that Christians do not just barely survive in their well-nigh invisible little corner, but that they are still there and have an important message between all the secular messages of our time. This entry was posted in Uncategorized on December 19, 2014 by Reinder. Avontuurlijk Wandelen: Onderweg met de Bijbel (Adventurous Walks: En Route with the Bible)—not counting his Ph.D. dissertation, this is the first book by Tom de Bruin and it definitely gives a taste for more. Since about two years Tom is the executive secretary of the Seventh-day Adventist Church in the Netherlands. Before assuming this post he worked for a number of years as a local church pastor. During this period he obtained a doctorate in theology. And now, in between all his other duties, he managed to write a very interesting and stimulating book. In this very accessible, but certainly not superficial, book, the author demonstrates how many texts and concepts in the New Testament become a lot clearer if you view them not just against the background of the Old Testament, but also compare them with various documents that were written in the Jewish community, in the last two centuries BC and in the first century AD. Some Adventist readers will have to get used to the idea that in writing down their messages, the New Testament authors used images and concepts that the earliest readers were acquainted with from their exposure to other (extra-biblical) documents. Books like that of Tom de Bruin will be warmly welcomed by many readers, because of their fresh perspective on the ‘old book’. But other readers may be left somewhat confused. They may say: ‘Is God’s Word really that difficult? Must we study these ancient documents that are not part of the canon, if we want to understand the Bible in more depth? Another book that has recently appeared in the same series as Tom’s book (and the plan is to regularly publish more volumes in this series) is: Waar Woont God? (Where Does God Live?) by Jean-Claude Verrecchia. I translated this book some time ago, with a lot of satisfaction. Verrecchia’s book is about the various sanctuaries that we encounter in the Bible and the spiritual lessons these different abodes of God have for us. Verrecchia paints important historical developments and shows us how God, through the ages, used many elements that belonged to the culture of the people who came to worship and brought their sacrifices to these sanctuaries. Verrecchia’s book illustrates how God’s revelation was linked to the historical and cultural circumstances of the time in which it was given and/or written down. We do not simply find the truth by a ‘plain reading’ of the text, but must discover it behind the forms and cultural peculiarities that the people who first received the biblical words were acquainted with. Also with respect to Verrecchia’s book, many readers will be very appreciative of the new insights the book gives them, while others may find that they are left with more questions than they had before they started reading the book. One of the key issues for contemporary Adventism is how to read the Bible. It is a question that demands a lot of attention from the leadership of our faith community. A church that publishes books like those of Tom de Bruin and Jean-Claude Verrecchia, also has the responsibility to ensure that the readers will understand how the questions that are raised in such books fit into a larger framework of inspiration and hermeneutics (the principles of a responsible interpretation of the Bible). I hope that they will work on this with courage and vision. PS 1 Both books (in Dutch) may be obtained from the Service Centrum, Kerk der Zevende-dags Adventisten, Amersfoorse weg 18, 3712 BC Huis ter Heide. They may also be ordered through the webshop: www.adventist.nl. PS 2 Did you already download my new e-book ? Present Truth Revisited: An Adventist Perspective on Postmodernism. Order at www.amazon.com. See my previous blog. This entry was posted in Uncategorized on December 12, 2014 by Reinder. At times it proves difficult to get your book published by an Adventist publisher. Even the larger publishing organizations such as Review and Herald and Pacific Press publish only a limited number of titles per year and often even good manuscripts do not make it into print. Some time ago I sent them a manuscript about postmodernism and an Adventist perspective on this phenomenon. To my disappointment their response was that they would not publish it. Of course, this happens to most authors from time to time. But I was told that the reason for the refusal was not that it was not a good and interesting book, but that publication would not be opportune in the current, rather intolerant, climate in the church. That gives a lot of food for thought! I considered to publish the book myself in the traditional way. But the process of producing a paper version of a book gives a lot of head aches (and costs a certain amount of money). In addition there are all kinds of problems regarding distribution and administration. Recently, however, amazon has entered the Dutch market with a site for e-books. And it proves to be surprisingly easy to publish one’s e-book through this channel. So, that is what I did in this past week. 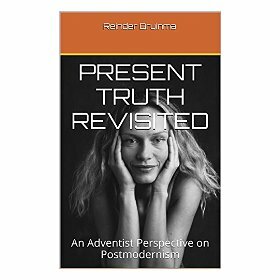 The e-book is in English and is entitled Present Truth Revisited, with the subtitle: An Adventist Perspective on Postmodernism. It can be downloaded from www.amazon.nl. When you are on the site, simply type my full name (reinder bruinsma) or the title of the book, and you will find the book within seconds. The content is the equivalent of about 175 pages in a paper back book). There is a modest price tag: 7,47 euro (or $ 9,19). Those who do not live in the Netherlands can also order through other amazon sites. This book deals with important questions as: What is postmodernism? Is it real? What are the characteristics of a postmodern person? Am I a postmodern person? The book then probes the question how Christianity (the church as well as the individual believer) has been affected by postmodern thinking. And specifically: Has the Adventist Church also been affected by postmodernism? Is that good or not so good? How does a ‘modern’ Adventist Christian differ from a ‘postmodern’ Adventist Christian? And how can postmodern people be approached with the Christian message? Finally, the author wants to show how, in fact, the Adventist interpretation of the Christian faith becomes more relevant if some of the key beliefs and practices are seen through a postmodern prism. I hope the book will be well received and that many of my blog readers will tell others about it. And I also hope that it will encourage an intensive discussion about the issues of this book in many places. This entry was posted in Uncategorized on December 9, 2014 by Reinder. Last week I mentioned at the end of my blog a new book written by Richard Rice and I indicated that I wanted read it as soon as possible. In the meantime I have indeed read the book and I do not regret that I started almost immediately after I received it in the mail. The title of the book indicated very clearly what the book is all about: Suffering and the Search for Meaning. The subtitle clarifies this further: Responses to the Problem of Pain. Dr. Rice presupposes no extensive theological knowledge on the part of the reader, but he does assume that he/she has a theological interest. He writes about a topic that, through the ages, has occupied the minds of professional theologians as well as of ‘ordinary’ believers. Theologians have usually referred to this issue with the term: theodicy. On the internet I found the following succinct and helpful definition: The defense of God’s goodness and omnipotence in view of the existence of evil (http://www.merriam-webster.com/dictionary/theodicy). In this very accessible book Rice provides a survey of various approaches to this topic. (1) All suffering and misery in some way is part of God’s plan for humankind. Admittedly, we often do not understand why God would approve or allow the events that occur. But he makes no mistakes and we must trust that in his good time all things will fall into place. (2) God is not to blame for the fact that there is so much suffering in the world. It is the result of man’s free will. God did not want robots, but created beings that would love and serve him from their own free will. God took the risk that things might turn sour, but that does not make him responsible for our wrong choices and thus for all the suffering we see in the world. (3) We may not be able to find explanations for all the suffering that we see and experience, but we can appreciate the fact that the things that happen to us have the potential of stimulating our inner growth and helping us to mature spiritually. (5) The advocates of ‘open theism’ and of the so-called. ‘process-theology’ (an approach that goes beyond ‘open theism’) opt for a different kind of response. They tell us we should revise our point of departure. God is not omniscient and not all-powerful in the classical sense of those terms. God does not know exactly how we will decide to use our free will, and by taking our free will very seriously, he does not have the possibility to intervene when we make wrong decisions. (6) And then, finally, there are those who say that every theodicy must necessarily fail. They protest against any suggestion that we may find a way of reconciling the misery in the world with the existence of an almighty and loving God. The book by Richard Rice is of great value because it provides such a lucid survey of the various options and then deals with the strong and the weak points of each theodicy. But it receives much added value though the way in which the author also deals with the personal dimension of the problem. Human suffering is not just a philosophical and theological problem (in fact, he prefers the term ‘mystery’). Sooner or later it affects all of us very personally. Rice proposes that we might combine aspects from the various theodicies and that we might distill ‘fragments of meaning’ from the different approaches and thus find comfort and support when we are struck by personal disaster. Richard Rice is a gifted thinker and author. He is one of the most important and most creative Adventist theologians of our time. It is therefore a pleasure to warmly recommend his newest book. Without any reservations I use this blog to promote it. It was published by a prestigious American evangelical publisher: IVP Academic. It is easy to order, in paper form or as e-book through Amazon.com—and undoubtedly also through other channels. With postage it should cost you between 15 and 20 dollar. You will find that it is money well spent. This entry was posted in Uncategorized on December 4, 2014 by Reinder.